The High Resolution Camera (HRC ) is a microchannel plate (MCP) instrument comprised of two detectors, one optimized for imaging (HRC-I), and one (HRC-S) which serves as a read-out for the Low Energy Transmission Grating (LETG) discussed in Chapter 9. The HRC-I provides the largest field-of-view ( ∼ 30′×30′) of any detector aboard Chandra, and its response extends to energies below the sensitivity of ACIS (Chapter 6), albeit without comparable spectral resolution. The time resolution of the HRC detectors (16 μsec) is the best on the observatory, but can only be utilized under certain conditions as discussed in Section 7.11. A schematic of the HRC layout is shown in Figure 7.1, and a summary of the characteristics is given in Table 7.1. A cross-section of the HRC-S layout and the relationships to the optical axis and the LETG Rowland circle are shown in Figure 7.2. 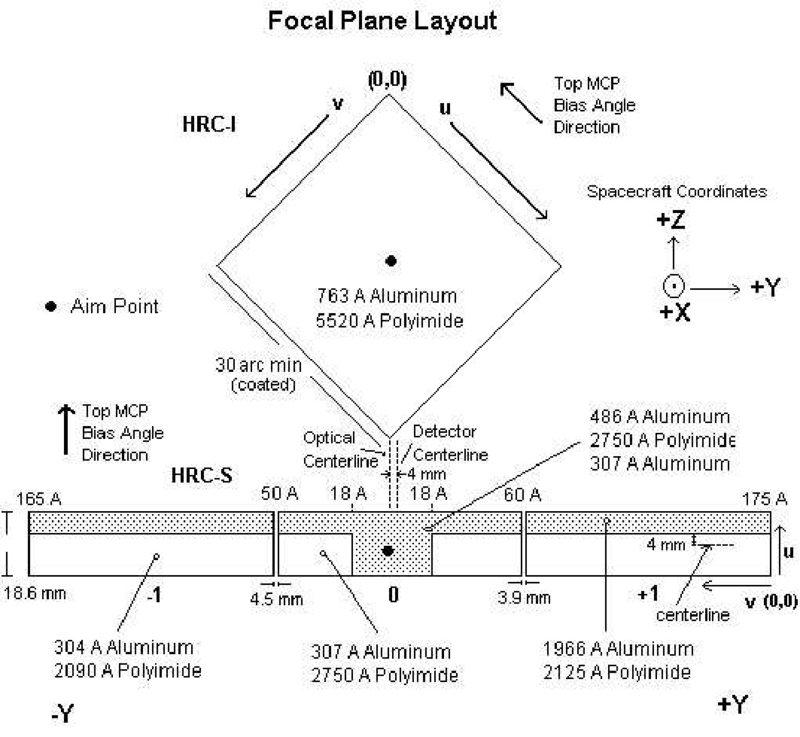 Figure 7.1: A schematic of the HRC focal-plane geometry as viewed along the optical axis from the telescope towards the focal plane. Figure 7.2: A schematic cross-section of the HRC-S MCP (not to scale). The HRC-S is shifted 0.1 mm forward of the tangent plane, so the Rowland circle intersects each segment at two points. The HRC is a direct descendant of the Einstein (Giacconi et al. 1979) and ROSAT High Resolution Imagers (HRIs) (David et al. 1996). The ROSAT HRI had the same coating (CsI) as the HRC. The Instrument Principal Investigator is Dr. Ralph Kraft of the Smithsonian Astrophysical Observatory. 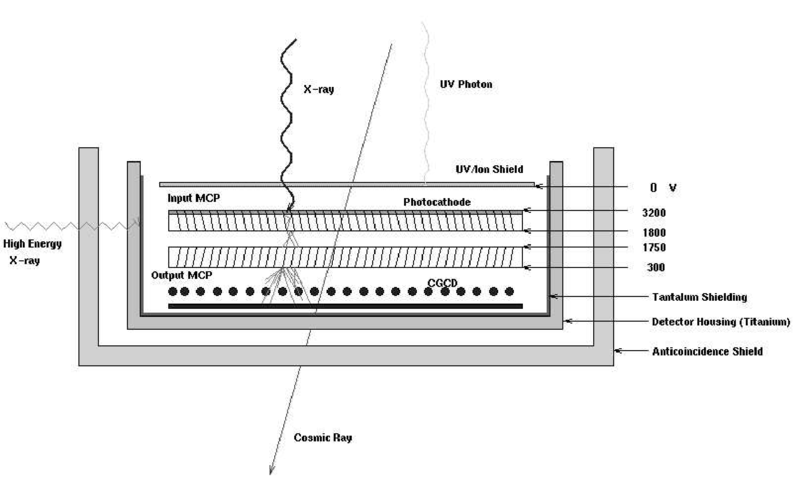 Figure 7.3 illustrates the features of the HRC MCP s. X-rays enter through a UV/Ion shield , necessary to reduce/avoid signals from UV light, ions, and low energy electrons. Most of these X-rays are then absorbed in the CsI-coated walls of the first (input) of two consecutive MCPs. The axes of the millions of tubes that comprise the input and output MCPs are not parallel to the optical axis but are canted ("biased") at an angle of 6° in opposite directions as shown in Figure 7.3. This bias improves the probability of an interaction. The CsI coating enhances the photoemission over that from a bare MCP. The resulting photoelectrons are then accelerated by an applied electric field. The next interaction with the walls releases several secondary electrons and so on, until a cascade of electrons is produced. Figure 7.3: A schematic of the HRC Microchannel-Plate detector. One purpose of the second (output) MCP is to provide additional gain. In addition, reversing the direction of the second MCP's bias angle with respect to the first removes a clear path for positive ions, and hence reduces the possibility of (positive) ion feedback - where an accelerated ion moving in the opposite direction as that of the electrons ends up causing the release of electrons and starts the process all over again. The electron cloud - typically about 2×107 electrons per photon - that emerges from the output MCP is accelerated towards a position-sensitive charge detector. The HRC employs two types of charge detectors: the HRC-I uses a crossed grid charge detector , while the HRC-S uses a hybrid where one axis is comprised of wires and the other has gold lines deposited on a ceramic substrate. Adjacent wires (or lines) are resistively connected and every eighth wire is attached to a charge-sensitive amplifier, referred to as a "tap", as illustrated in Figure 7.4.
where cp is the coarse position, Qcpi+1 is the charge measured on the cpi+1 tap, and ∆ is the distance between taps. Since the charge cloud extends beyond the two outer taps, each of the outer amplifiers underestimates the amount of charge needed to calculate the true centroid. For an event perfectly centered on the middle tap, the amount of charge missed by the two outer taps cancel in the equation. If however, the event position is not over the center of a tap, the fractional amount of missing charge is different and produces a small systematic error in the reconstructed position. The small systematic positional error combined with the coarse position logic produce "gaps" in the HRC images. These gaps are perfectly aligned with the detector axes and correspond to positions exactly half-way between amplifier taps. The gaps are systematic and are removed in data processing. Figure 7.4: Schematic representation of event position determination for one axis of the crossed grid charge detector (CGCD). 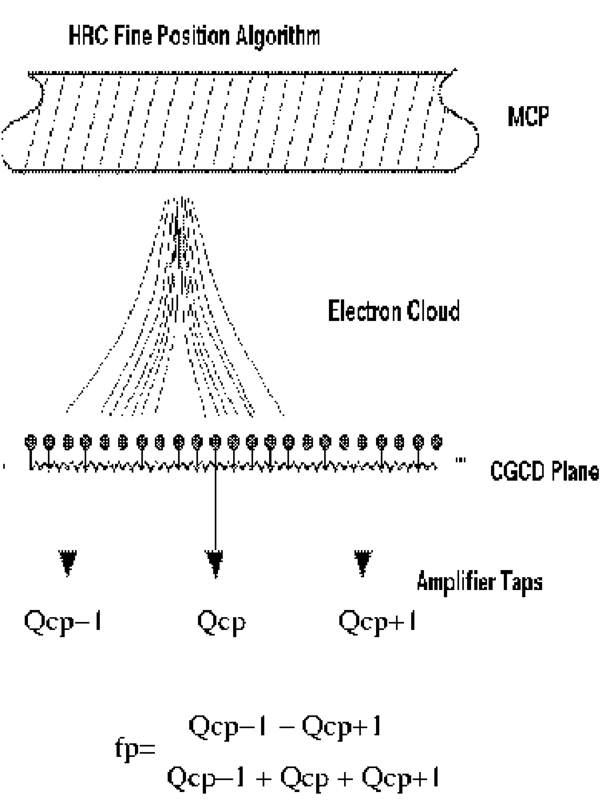 The electron cloud is divided between several amplifiers. The position of the event relative to the central coarse position is calculated from the difference between the signals on either side of the coarse position divided by the sum of the three signals. are highly correlated. 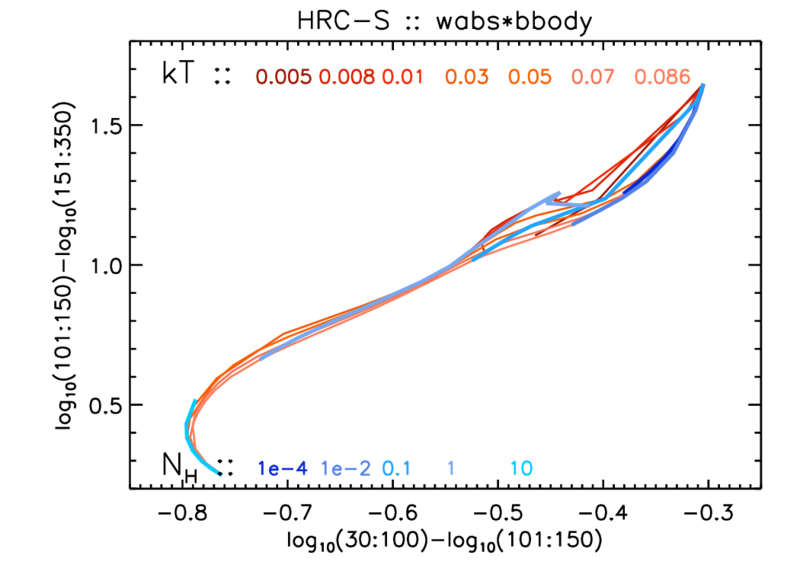 In fact, a scatter plot of these two quantities for X-ray induced events closely describes a hyperbola. 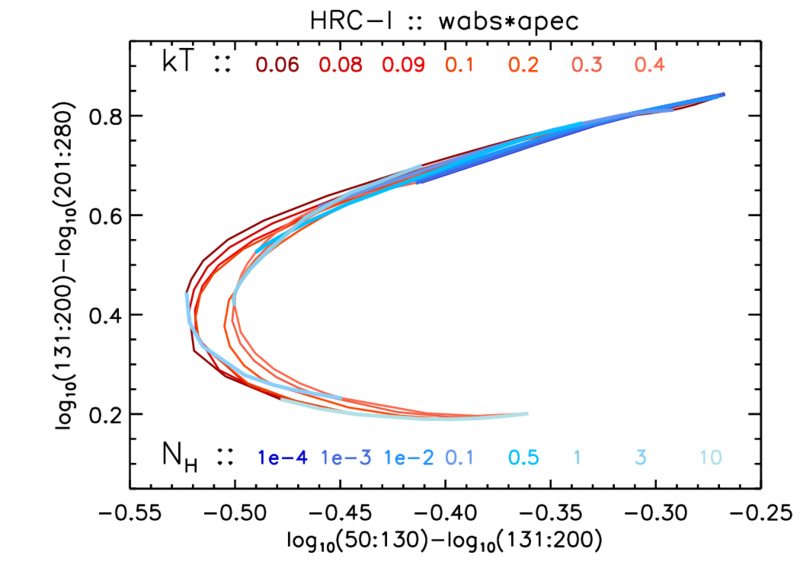 Non X-ray events, primarily those due to the passage of charged particles, produce charge distributions that are often larger and more spatially extended and complex. As such, it is possible to remove many non-X-ray background events by filtering out those events that do not fit the hyperbola. Furthermore, since the charge distribution is centrally peaked, the complement Qcpi term is larger and less susceptible to noise-induced errors than the Qcpi+1 −Qcpi−1 difference term. It is therefore possible to use the complement term, and the best fit hyperbolic locus, to correct those events where instrumental noise has compromised the three-tap fine position. A much more detailed explanation of this technique is presented in Murray, et al. (2000). For more details concerning the HRC see Murray & Chappell (1989) and Zombeck et al. (1995). The aimpoints are the positions on the instrument where the flux from a point source with no commanded offsets is placed. Note that unlike ACIS, where the aimpoint position is offset by ≈ 10−20" from the optical axis1, there are no offsets for the HRC. Offsets may be set for spectroscopic observations on the HRC-S (see Section 9.3.1). There are two nominal aimpoints (see Table 4.3) as indicated in Figure 7.1 - one at the approximate center of the HRC-I, and the other slightly off-center on HRC-S. The HRC-S aimpoint Z-offset places the LETG-dispersed image along the centerline of the thinner part of the UV/Ion Shield (the two white rectangles in the diagram; see Section 7.8). The HRC-S aimpoint Y-offset is slightly off-center, so that the boundaries between the three HRC-S segments correspond to different wavelengths of the grating-dispersed spectrum (see Chapter 9 for details). The Chandra aimpoint is known to drift relative to the optical axis by 10-25 arcsec (Sec 5.4.3; see also Sec 4.5). This drift has been attributed to temperature fluctuations in the Aspect Camera Assembly. As a result, the nominal aimpoint is offset from the optical axis by the amount of the drift. This offset has no effect on the accuracy of the astrometry. Nominal aimpoints are expressed in terms of a permanent default aimpoint with an associated error box, as explained in 4.5. An automatic offset correction is applied to all ACIS observations to position the nominal pointing near the permanent default aimpoint (see 6.11). However, such corrections are not applied to HRC observations, since the HRC does not have instrumental structures like node boundaries or chip gaps that require careful positioning of the source on the detector. Displacement of HRC pointings due to uncorrected aimpoint drift is comparable to the magnitude of aspect dither, and has a negligible effect on the measured rate and the shape of the PSF. Attached to the HRC are two mechanical blades that serve as shutters. These shutters were used to block out portions of the incident flux to aid in focusing the HRC. The blade position settings are variable and were designed to allow one to block the zero-order image of a grating observation. Currently only one blade is functional, and we do not offer use of this shutter as an observing option. The spacecraft is dithered during all observations in a Lissajous figure. For observations with the HRC, the dither amplitude is 40 arcsec peak-to-peak, with nominal periods of 1087 (in Y) and 768 (in Z) sec. Dithering serves to average out pixel-to-pixel variations in the response. It also eliminates gaps in spectral coverage with the LETG/HRC-S combination caused by the HRC-S intersegment spaces near -50 Å and +60 Å (see Figure 7.3). The effects of dither are removed during ground processing of the data. Imaging with the HRC is best performed with the HRC-I because of the much lower background (Section 7.10) and larger field of view. The intrinsic PSF of the HRC is well modeled by a Gaussian with a FWHM of ∼ 20 μm ( ∼ 0.4 arcsec). The HRC pixels, determined by the electronic read-out (not the pore size), are 6.42938 μm (0.13175 arcsec). The HRC response is thus well matched to the intrinsic HRMA resolution (Chapter 4). Approximately 90% of the encircled energy lies within a 14 pixel diameter region (1.8 arcsec) from the center pixel for the observation of AR Lac shown in Figure 7.5. The measured PSF is as good or better than the simulations because a very conservative pre-flight estimate of the aspect solution was used in the simulations. Deconvolution of aimpoint AR Lac and Capella observations carried out at different parts of the detector show that an anomalous feature developed c.2003 (Juda & Karovska 2010). While initially suspected to be due to detector blur, it has since been verified to be present in ACIS data as well (Kashyap 2010). The Chandra PSF shows an unexplained enhancement in the profile at distances of ≈ 0.8" from the source centroid (see §4.2.3). 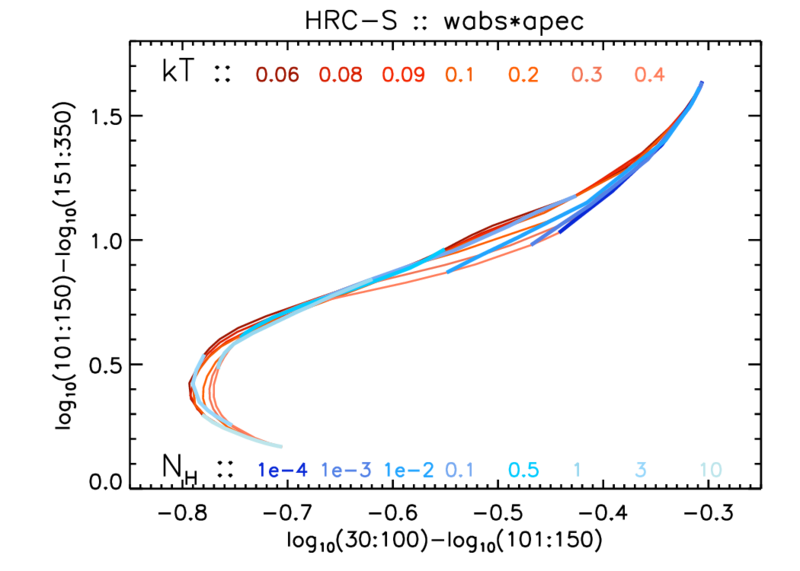 This anomaly is in excess of that expected from ray trace simulations, and is preferentially oriented towards the mirror spherical coordinate angle of φ = 285° (see the CIAO caveats page http://cxc.harvard.edu/ciao/caveats/psf_artifact.html), and is approximately oriented towards the spacecraft +Z axis (see Figure 1.2). The asymmetry is illustrated for an HRC-I observation of an on-axis pointing of AR Lac in Figure 4.17, and the magnitude of the asymmetry is illustrated for a number of low-count-rate on-axis point sources in Figure 4.19. Figure 7.6 depicts the anomaly for Capella observations carried out at different parts of the detector. The HRC read-out blurs event locations, and contributes an additional broadening of the HRMA PSF. Based on an analysis of transient hotspots, the intrinsic detector blur has been modeled as a combination of a Gaussian and an offset Beta profile, and is incorporated in the ray trace model. We have constructed an empirical PSF by combining on-axis HRC-I observations of AR Lac (Kashyap & Jerius 2016, http://cxc.harvard.edu/cal/Hrc/PSF/empPSF.html). This PSF minimizes blurring caused by detector effects by excluding events that are affected by tailgating (see §7.11), removing distortions induced by degapping offsets between adjacent taps, and using only the lower gain events that have more reliable determinations of event positions. 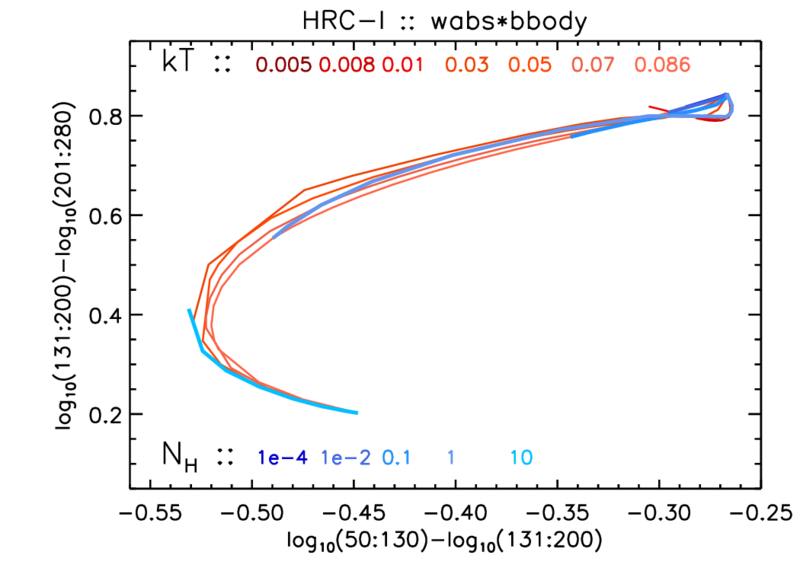 Figure 7.5: The predicted and observed fractional encircled energy as a function of radius for an on-axis source observed with the HRMA/HRC-I. The solid black curve shows the empirical PSF, based on accumulated AR Lac observations, representing the current best sharpness achievable. 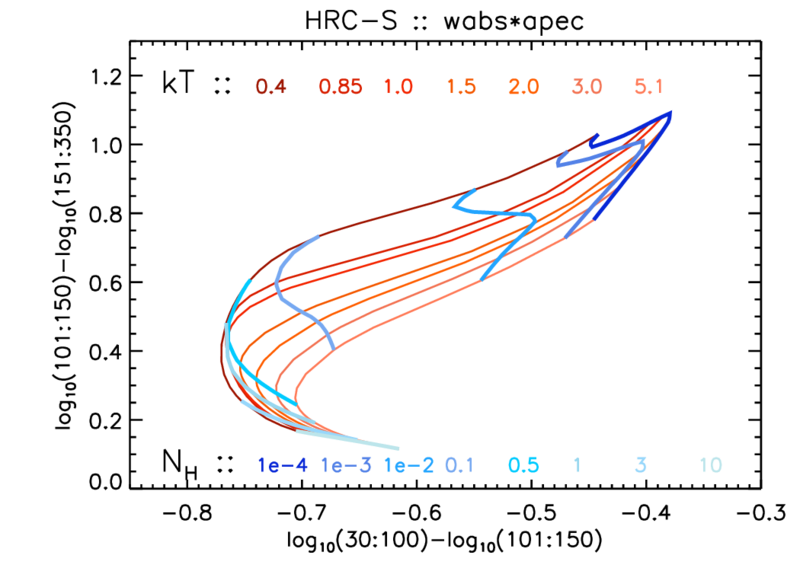 Raytrace models at different energies (dashed red for 0.28 keV, dash-dotted green for 1.5 keV, and dotted blue for ≈ 6.4 keV) are also shown for qualitative comparison. The raytraces incorporate HRC-I detector blur and aspect dither for a set of representative on-axis AR Lac observations but do not include other effects. The imaging resolution of the HRC-I degrades off-axis for two reasons: the HRMA PSF increases in size with increasing off-axis angle, and the deviation increases between the flat HRC-I detection surface and the curved HRMA focal surface. The off-axis imaging behavior of the HRC-I is shown in Figure 7.7. The nominal best-focus of the HRC-I is chosen to provide the best image quality in the center of the field-of-view. Figure 7.6: The PSF anomaly illustrated with HRC-I observations of Capella over different locations on the detector. Two observations close to the nominal aimpoint (ObsIDs 6559, 8360; top row) are shown along with two at the extreme ends of the detector (ObsIDs 6558, 8343; bottom row). Each panel is also labeled with the detector (U,V) coordinates that the sources span. The observations have slightly different roll angles, and the direction of the anomaly is indicated with an arrow of length 0.8". 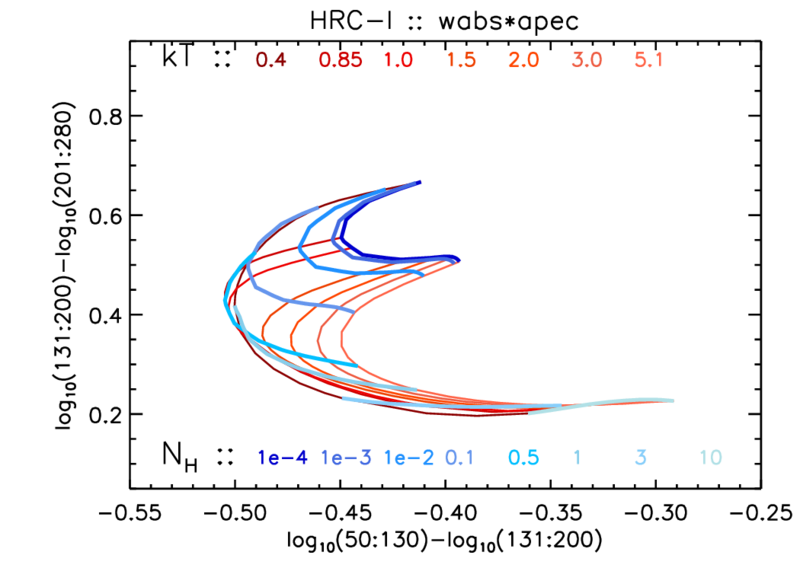 An asymmetry is discernible within each of the annuli (centered on the sources and spanning 0.8" − 1.2"); there is an excess of counts in the direction of the anomaly. 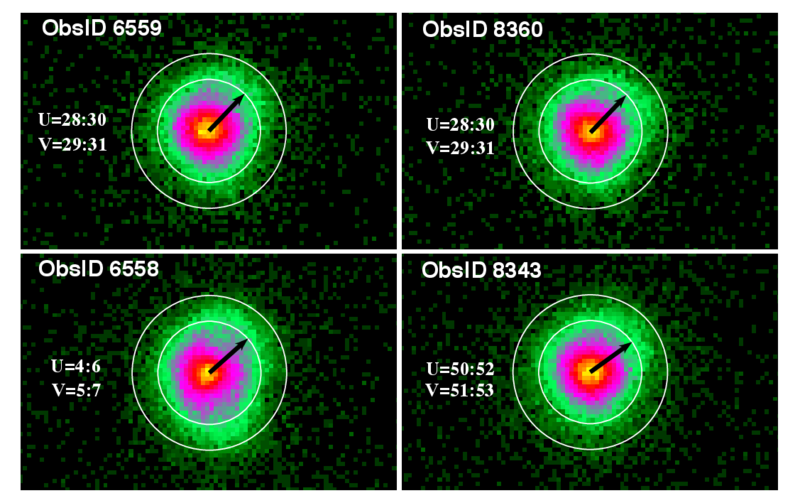 (ObsID 6558 also shows an asymmetry pointing towards the bottom right, towards the detector −U direction, which is due to residual ghost events (§7.10). Figure 7.7: Encircled energy as a function of source off-axis angle for 50% and 90% encircled energy for 1.49 and 6.40 keV for the combined HRMA/HRC-I. A conservative contribution from the aspect solution is included (FWHM = 20 μm (0.41")). A plot for the HRC-S would be almost identical since the PSFs of the two instruments are virtually identical. 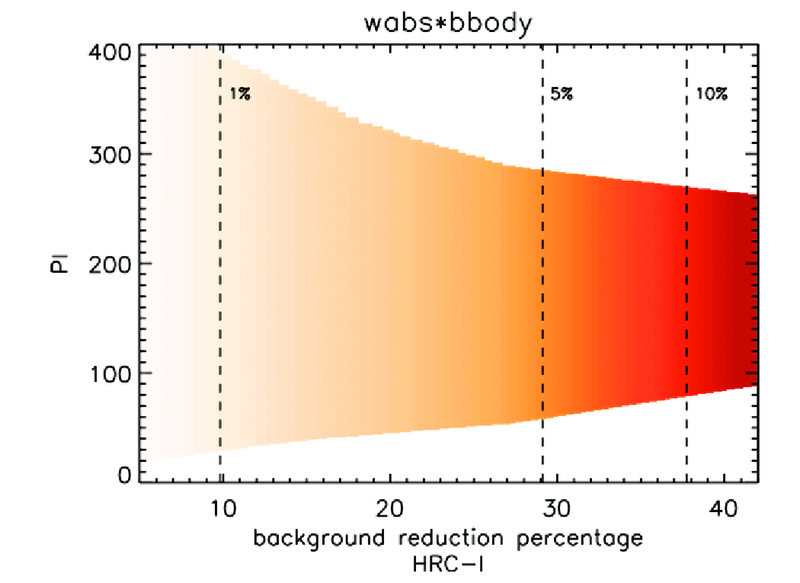 The intrinsic energy resolution of the HRC is poor (see Figure 7.8, which shows the HRC-I pulse height distributions for six energies obtained during sub-assembly calibration; the distributions for the HRC-S detector are somewhat narrower). Even though the pulse-height amplitude (PHA) of each event is telemetered, spectral fitting cannot be usefully carried out for sources observed with the HRC. For low-resolution spectra such as these, standard spectral analysis techniques or visualization strategies cannot be used. In particular, analysis must only be done in channel space, and plots made in energy or wavelength space will convey no useful information. However, though spectral modeling is not feasible, there is sufficient resolution that hardness ratios may be used to distinguish between gross differences in the spectra (see Figures 7.9 - 7.12, which show color-color grids for some common spectral models). Figure 7.8: Pulse height versus energy for the HRC-I detector (top) and the centroid of the pulse height distribution versus energy (bottom). These data were obtained at SAO during flat field, normal-incidence-illumination tests. The voltage settings have been changed in-flight and thus the applicability of these data is questionable. They are presented here only for illustrative purposes. 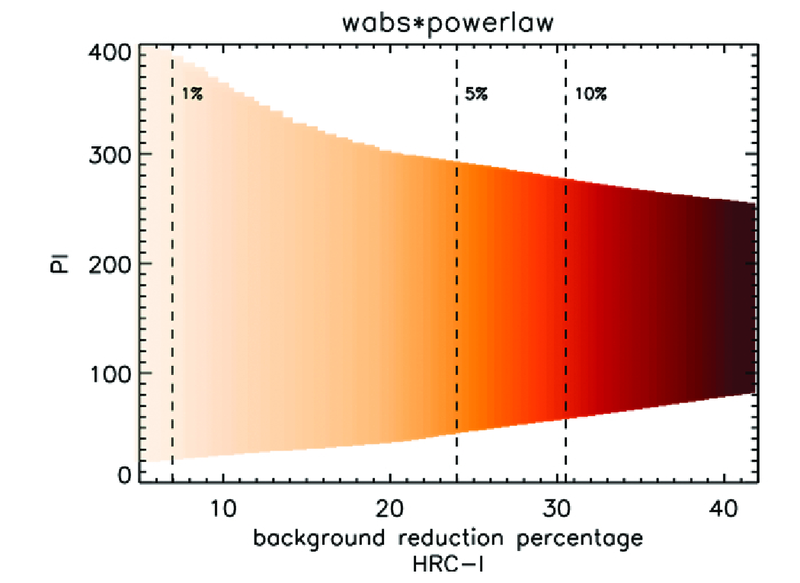 Figure 7.9: The color-color grid for a power-law spectral model, as calculated for the HRC-I (left) and the HRC-S (right). The PI channels are grouped into three bands, S=50:130, M=131:200, and H=201:280 for the HRC-I and S=30:100, M=101:150, and H=151:300 for the HRC-S, and their logarithmic ratios are plotted along the two axes for specific values of the model parameters α (the index of the power-law function) and NH (the absorbing column density in units of 1022 cm−2). Lines of constant α are depicted in red shades, and lines of constant NH in blue shades. Figure 7.10: As in Figure 7.9, for an APED thermal model at relatively low temperatures. The loci of constant plasma temperature (kT) are in shades of red and are labeled by their value in keV. Figure 7.11: As in Figure 7.10, for a set of higher plasma temperatures. Figure 7.12: As in Figure 7.9, for a blackbody model. The loci of constant temperature (kT) are in shades of red and labeled by their value in keV. HRC-S is optimized for use with the Low Energy Transmission Grating to become the Low Energy Transmission Grating Spectrometer (LETGS; see §9). The HRC-I can also be used but, because the HRC-I surface is flat and does not follow the Rowland circle, sharp spectral features cannot be measured as well as on the HRC-S. Furthermore, the wavelength coverage of the HRC-I is smaller than that of the HRC-S because of its smaller lateral extent. The High Energy Transmission Grating (HETG) is nominally not supported for use with HRC at this time. Nevertheless, observations have been carried out in the HETG+HRC-I configuration, and its use is feasible. A comparison of the effective areas of the HETG+HRC-I and HETG+ACIS-S configurations are shown in Figure 7.13. The effective areas are calculated nominally for specific observations (ObsID 13712, GX 3+1, observed in 2012-Feb with HETG+HRC-I; ObsID 17393, 3C 273, observed in 2015-Jul with HETG+ACIS-S). The HETG+HRC-I configuration generally has higher sensitivities at wavelengths > 13Å in the MEG, and could be useful when line-rich sources are observed. In the HEG, the HETG+ACIS-S configuration has higher effective areas over almost the entire range that the HRC-I can observe. Because of the limited intrinsic energy resolution of the HRC-I, order separation is not possible. Figure 7.13: Comparison of effective areas from HETG+HRC-I and HETG+ACIS-S. The HETG was used with the HRC-I during an observation in 2012-Feb (ObsID 13712). The effective areas computed using CIAO tools for that observation is compared to that from a recent HETG+ACIS-S observation (ObsID 18364; 2016-Jul). The HEG and MEG effective areas (red for +1, blue for −1, green for combined) are shown for the HRC-I (solid lines) and ACIS-S (dashed lines) in the top panels, and the respective ratios in the bottom panels. The HRC-I/MEG has a larger effective area compared to ACIS-S/MEG at wavelengths >~13 Å. The HRC-I/HEG effective area vanish at 14Å as the photons fall outside the detector for this source, which was observed at the aimpoint. There are significant spatial and temporal gain variations present in both instruments (see Figures 7.14, 7.15). Gain correction maps, available since CALDB v3.2.5, correct the spatial variations (for both HRC-I and HRC-S) as well as correct for the temporal gain drop (for the HRC-I). These gain correction files transform the measured PHA values to Pulse Invariant (PI) values that are uniform across the detector (to ≈ 5% over a tap) and correspond to the PHA values seen early in the mission. Note that starting from CIAO v4.2/CALDB v4.2, the gain map is applied to the scaled sum of the amplifier signals (SUMAMPS) rather than to PHA to generate a better behaved PI distribution (Wargelin 2008, Posson-Brown & Kashyap 2009). In March 2012, the voltage of the HRC-S was increased to mitigate the QE loss that was occurring at long wavelengths due to gain decline (Wargelin 2012). See Chapter 9 for details. 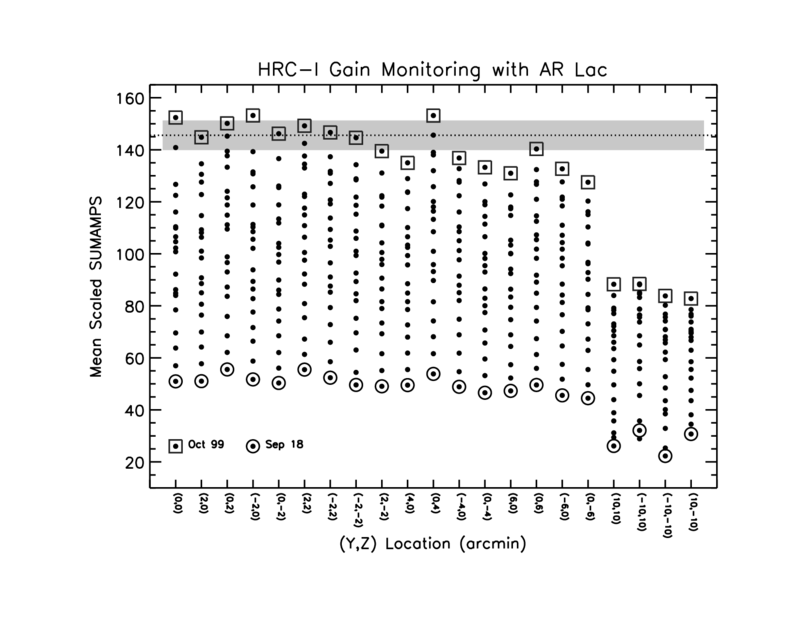 Figure 7.14: The mean scaled sum of the amplifier signals (SUMAMPS) for AR Lac observations, carried out at various times (filled circles) and numerous locations across the HRC-I detector (Y,Z offsets as labeled along x-axis), are shown. There also exist intrinsic variations in the spectrum which have not been accounted for in this figure. The values from data obtained at the beginning of the mission (square boxes) and the latest measurement (circles) are marked. Note the steady decline in the mean scaled SUMAMPS with time for all pointings; the gain maps in the CALDB can be used to renormalize them such that they are equivalent to an on-axis observation made in 1999-Oct. The horizontal dotted line represents the average gain corrected Pulse Invariant (PI) values and the shaded band represents the 1σ scatter on them. 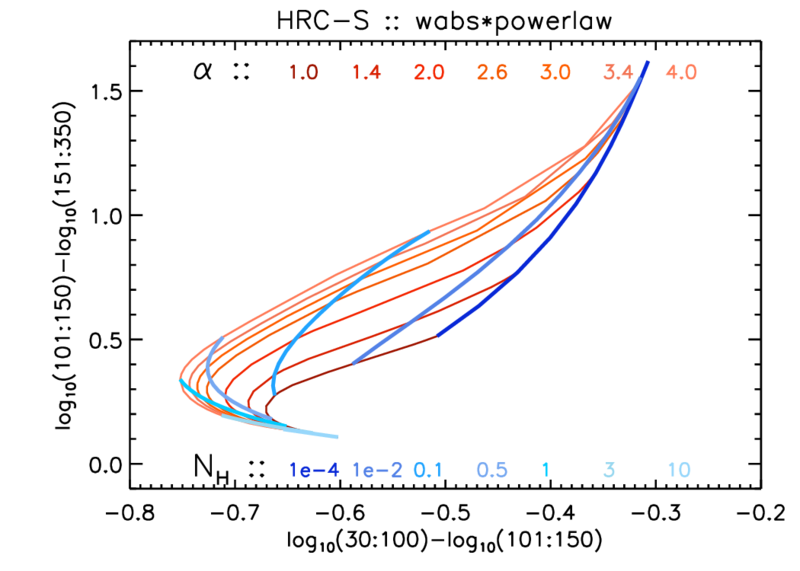 Figure 7.15: The mean scaled SUMAMPS at each epoch (solid filled circles) declined with time at all pointings from the beginning of the mission (open squares) till before the voltage change (open triangles). After the voltage was increased in 2012-Mar, the mean SUMAMPS increased (open diamonds) to nearly the same level as at the beginning of the mission, and have decreased since then (open circles) to nearly the same values as before the voltage change. The horizontal dotted line represents the gain corrected Pulse Invariant (PI) values based on the current gain, and the shaded band represents the 1σ scatter on them. The placement, composition, and thickness of the various UV/Ion shields (filters) are shown in Figure 7.1. Details of the UVIS transmission as a function of energy can be found at http://cxc.harvard.edu/cal/Hrc/detailed_info.html#uvis_trans. The shields suppress out-of-band (outside the X-ray band) radiation from the ultraviolet through the visible. The detector response to out-of-band light for an object in its field-of-view is a possible source of unwanted signal. Suppressing out-of-band radiation is particularly important for observing sources which have bright EUV and UV fluxes. The HRC has strongly reduced sensitivity in this spectral region, as shown in Figure 7.16. As part of the in-flight calibration program the bright A star Vega (A0V, U=0.02, B=0.03, V=0.03) was observed with both the HRC-I and HRC-S. The predicted count-rate for HRC-I was 7×10−4 cts s−1. From monitoring observations of Vega, an upper limit to the UV rate of 8 ×10−4 cts s−1 is calculated (Pease et al. 2005). The image of Vega was also placed on three regions of the HRC-S - the inner segment "T", the thin aluminum inner segment, and on one of the thin aluminum outer segments. The predicted count-rates were 1, 400, and 2000 cts s−1 respectively. The corresponding observed rates were 0.2, 240, and 475 cts s−1. Sirius was observed with the HRC-S/LETGS to obtain a soft X-ray spectrum of Sirius B (white dwarf) and Sirius A (A1V, V=-1.46, B-V=0.01) was seen in zeroth order at about the expected count rate. Based on these sets of observations, the UV/Ion shields are performing as designed. Ongoing monitoring observations of Vega indicate no change in the UV response of HRC-I and HRC-S since launch. For a detailed discussion of the out-of-band response of the HRC to stars, see http://hea-www.harvard.edu/HRC/calib/palermopaper.ps , which allows one to determine the out-of-band count-rate produced by a blackbody source with known Teff, mV, and NH. Scattered UV, FUV, and EUV light from the Sun or the bright Earth may cause a background dependence on viewing geometry. The spacecraft was designed to limit the contribution from stray scattered radiation to 0.01 cts cm−2 s−1 (2.4×10−7 cts arcsec−2 s−1) on the HRC. 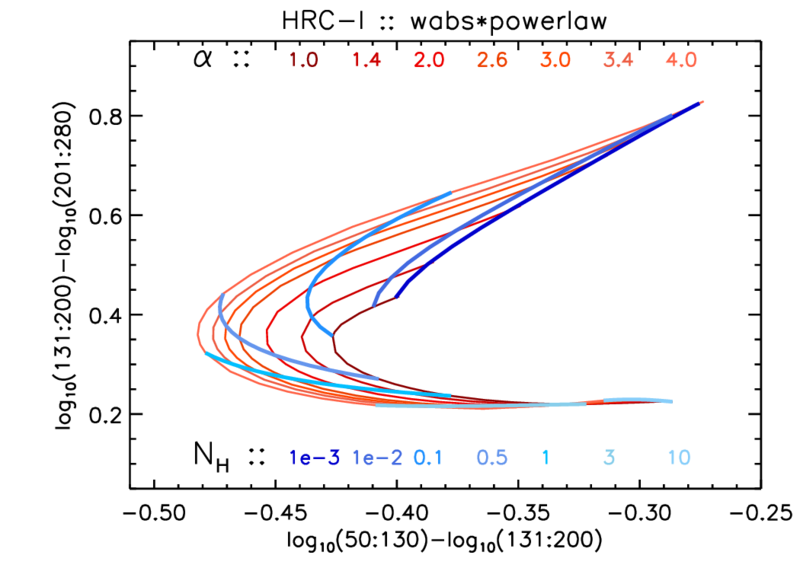 The imaged components of scattered radiation are dependent on the solar cycle, but are at most ∼ 0.01 cts cm−2 s−1 for most lines of sight. Figure 7.16: The HRC-I (top) and the center section of the HRC-S (bottom) UV/Ion shield effective area as a function of wavelength. The efficiency of the HRC detector is the product of the appropriate UV/Ion shield transmission and the quantum efficiency of the CsI coated MCP. Pre-flight flat field measurements show a 10% variation in the efficiency across the HRC-I. The HRC-S also exhibits efficiency variations of the same magnitude, with the complex structure of the HRC-S UVIS contributing to the spatial variations. In-flight observations of the steady coronal source Capella show that the HRC-I variation is known to better than ∼ 2% at high energies. There are time-dependent decreases in the QE for both HRC-I and HRC-S. The HRC-S decline is wavelength independent and amounts to ∼ 15−20% over the course of the mission. These corrections are incorporated into the corresponding CALDB files. The HRC-I QE has been stable at short wavelengths, but has declined by ∼ 10% at long wavelengths based on measurements of the white dwarf HZ 43. The HRC-I also shows some fluctuations at low energies at large offset locations, ∼ 10 arcmin away from the nominal aimpoint (see http://cxc.harvard.edu/ccw/proceedings/2007/presentations/possonbrown3/). The combined HRMA/HRC effective areas - the product of the HRMA effective area, the quantum efficiency of the HRC-I or the HRC-S and the transmission of the appropriate UV/Ion shield, integrated over the point spread function - are shown in Figure 7.17. Monitoring of the efficiency of both detectors is continuing. The charge extracted since launch has resulted in a small decrease in gain in both detectors, but this has had a negligible effect on the efficiency (See http://cxc.harvard.edu/cal/Hrc/ ). The HRC-S QE has been declining at a rate of <~1% per year. This decline is generally wavelength independent except for certain locations on the detector where the gain decline causes loss of photons below the lower level discriminator. The QE decline in the HRC-I is < 2% over the duration of the mission at long wavelengths. Figure 7.17: The effective area of the HRMA/HRC-I (dashed line) and the central segment of the HRMA/HRC-S in imaging mode (solid line) integrated over the full PSF. Absorption edges are due to the iridium coating on the mirrors, the CsI MCP coating, and the polyimide/Al of the UVIS. The HRC-I anti-coincidence shield reduces the on-orbit valid event rate by about a factor of 5 to ∼ 100 cts s−1 over the field; without on-board anti-coincidence vetoing the rate would greatly exceed the telemetry limit of 184 cts s−1. After standard processing, the Level 2 event file background rate is ∼ 1.7 ×10−5 cts s−1 arcsec−2. The background varies smoothly over the field with no more than a 10% difference between the center (lower) and edges (higher) of the detector. The background is not azimuthally symmetric (see Isobe & Juda 2009). Note, the total event rate remains unchanged, but detector events in coincidence with anti-coincidence events no longer enter the telemetry data stream. Before launch the expected rate, after vetoing the effects of cosmic rays, was 10-20 cts s−1 composed of mainly the internal rate of the MCPs (10-15 cts s−1), and a small contribution from cosmic rays due to anti-coincidence shield inefficiency. The anti-coincidence shield inefficiency has increased in recent years, and the quiescent background has increased by ≈ 10%. For observations where there is a chance that the telemetry saturation limit might be hit, the HRC Instrument Team has devised a new instrument mode that excludes the events recorded in the two outermost taps from being telemetered. This mode can be selected in consultation with Chandra uplink support contact scientists when the observation is scheduled. There is additional background in the HRC-I that is not well understood. For point source detection and exposure times of 100 ks or less the background is virtually negligible. However, for extended low surface brightness objects this relatively low rate can become significant depending on the specific details of the source. Ground-based filtering further reduces the non-X-ray background in the HRC detectors (see Murray et al. 2000, Juda et al. 2000 and Wargelin et al. 2001; http://cxc.harvard.edu/cal/Letg/Hrc_bg/). After filtering the non-X-ray background for HRC-I data is reduced by ∼ 40% while the corresponding reduction in X-ray events is less than a few percent. For the HRC-S, the non-X-ray background is decreased by ∼ 50% and the X-ray loss is 1−2%. Furthermore, filtering makes the spatial distribution of the detector background flatter. Filtering also removes saturated events responsible for faint secondary "ghost" images (see Section 7.11). The anti-coincidence shield of the HRC-S does not work because of a timing error in the electronics. The error is not correctable. As a result the event rate is very high and exceeds the telemetry rate limit. To cope with this problem the HRC team has defined a "spectroscopy region" which is about 1/2 of the full width and extends along the full length of the HRC-S detector. The spectroscopy region ( ∼ 10 mm) is implemented using the edge blanking feature of the electronics. With this change, the telemetered quiescent background rate is about 120 cts s−1. The background can be further reduced in ground data processing by using pulse height filtering that preferentially selects X-rays over cosmic ray events. A reduction in background by a factor of about three is possible for dispersed spectra. Thus there are two relevant background rates for the HRC-S: a telemetry rate of 120 cts s−1 and a post-processing rate for calculating signal-to-noise. The latter is discussed in detail in Section 9.3.6 (see especially Figure 9.22). 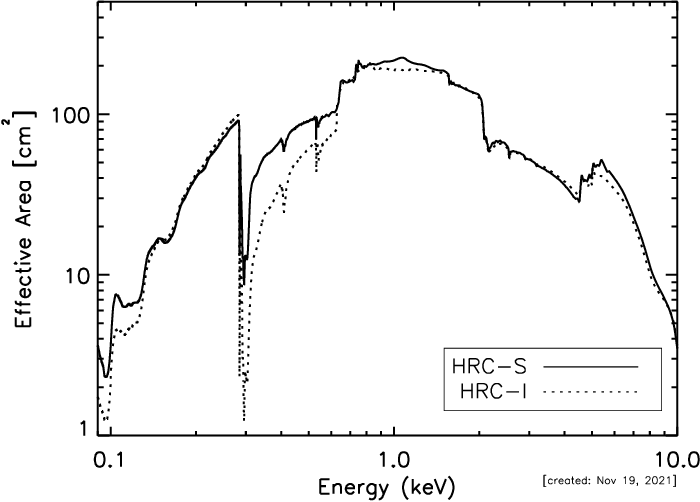 Both the HRC-I and HRC-S experience occasional fluctuations in the background due to charged particles. These periods of enhanced background are typically short (a few minutes to a few tens of minutes) and are anywhere from a factor of two to ten over the quiescent rates. The increased background appears to be uniformly distributed over the detector and introduces no apparent image artifacts. On average it seems that no more than about 20% of the observing time is affected by these events, and they are easily recognized in the secondary science rate data and so can be filtered out if desired. An example of this behavior is shown in Figure 7.18. See Juda et al. (2002) for more information on the HRC background. Figure 7.18: An example of the background variability during a ∼ 30 ks HRC-I observation of the SNR G21.5-09 taken on 1999-Oct-25. 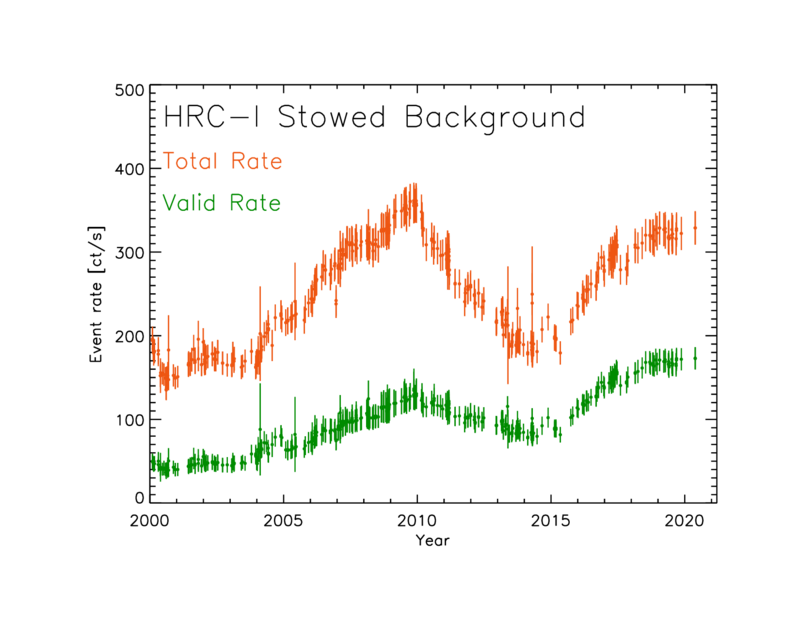 The total event rate (middle) and valid event rate (bottom) show correlated bursts up to ∼ 800 cts s−1. The bursts are uniformly distributed over the detector. 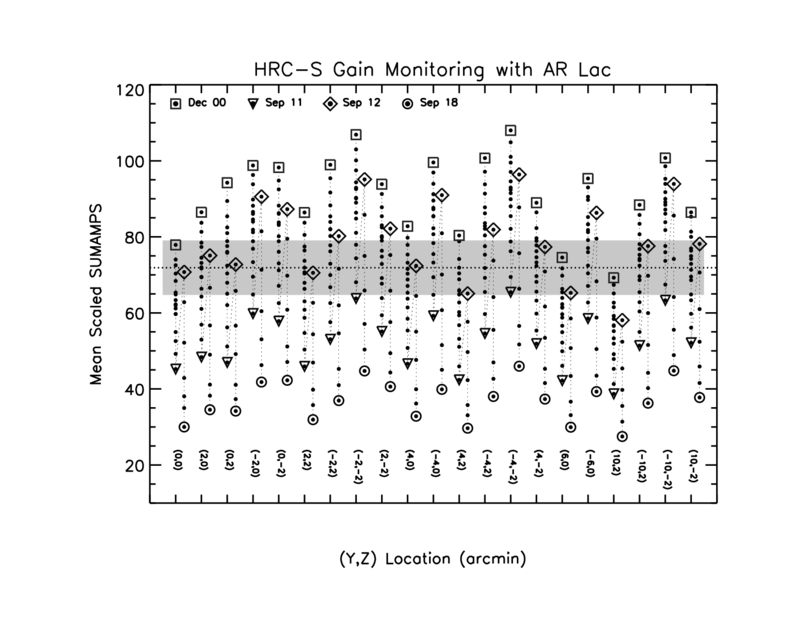 The anti-coincidence shield (top) exhibits no correlated enhancements. 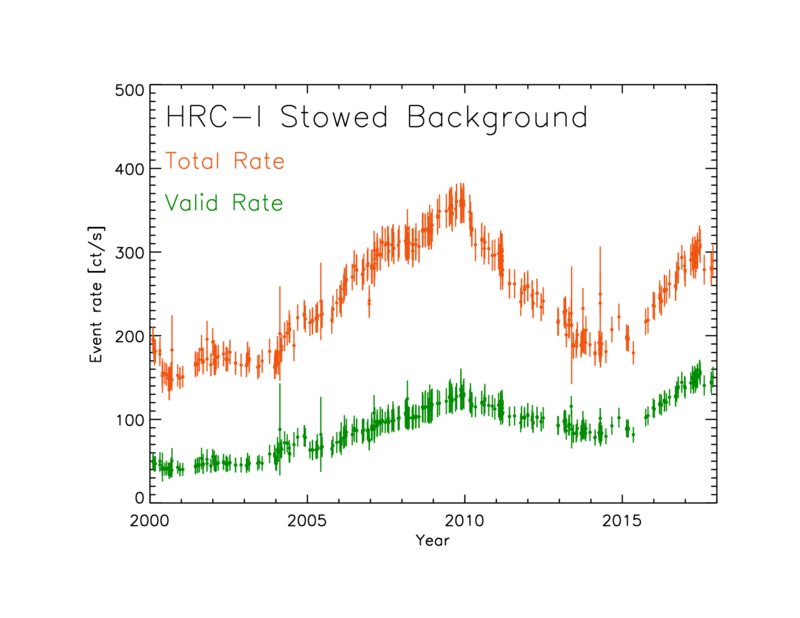 The total and valid rates differ by ∼ 200 cts s−1 due primarily to cosmic ray events that are vetoed and don't appear as valid events in the telemetry. The background increases due to increased cosmic ray flux during solar cycle minima. The difference between cycle minimum and maximum can be as much as a factor of two. On-orbit non-sky background spectra and events lists are available in CALDB for analysis and modeling. The spectra are obtained during yearly AR Lac observations (see Figure 7.19). A recipe for their use in filtering on PI to reduce background is described in the CIAO thread http://cxc.cfa.harvard.edu/ciao/threads/hrci_bg_spectra/. The events data sets are obtained during the times when ACIS is viewing the sky but the HRC MCP HV is at the operational level so that the HRC is sensitive to the cosmic ray flux. The data sets are event lists and can be processed and filtered the same as data from a sky observation. The datasets needed to make background images for use in constructing exposure corrected flat-field images are available in CALDB (since v4.3.0). A recipe for their use is described in the CIAO thread http://cxc.harvard.edu/ciao/threads/hrci_bg_events. Figure 7.19: Average background PI spectra in the inner 10′ region of the detector, obtained from yearly observations towards AR Lac are shown. Times of high background flaring have been excluded. The magnitude and shape of the spectra vary considerably with time, but may be interpolated between epochs to estimate the background for any given observation. Figure 7.20: The change in HRC-I stowed background rate with time. The total rate (red points and error bars, upper set) and the valid rate (black points and error bars, lower set) are shown. The HRC-S data are similar. Furthermore, much of the background can be alleviated by filtering out events with PI < 20 and PI > 350 on the HRC-I. The background is reduced by ∼ 20% even as only ≈ 1−2% of the source counts are lost (see Figures 7.21 - 7.23). The CIAO thread http://cxc.harvard.edu/ciao/threads/hrci_bg_spectra/ describes how to perform this estimate for different source models background spectra. This thread can also be followed to compute background reduction factors for non-grating HRC-S sources, provided that they are extended or are observed off-axis, and user generated background spectra are used. This approach for improving signal-to-noise is not recommended for sources observed on-axis with the HRC-S, since gain near the aimpoint varies significantly on very small scales and is not well calibrated, potentially leading to undesired filtering effects. The approach should also not be used for data obtained with a grating in place; see Section 9.3.6 for a discussion of background reduction using PI filtering for dispersed spectra. Figure 7.21: The range of PI that should be included to reduce the background by a given percentage is shown in the figure as a shaded band for an assumed absorbed power-law spectrum. All of the parameters included in the grid for Figure 7.9 are considered possible, and these PI ranges can be shrunk if more information is available for a particular source. The depth of the shading indicates how much of the source events are expected to be lost. The vertical dashed lines indicate the background reduction for source event losses of 1%, 5%, and 10%. As shown in Figure 7.19, the background varies with time. Here, for the sake of definiteness, we use the background from the year 2008. Figure 7.22: As Figure 7.21, but for sources with thermal spectra, for parameter values depicted in Figures 7.10, 7.11. Figure 7.23: As Figure 7.21, but for sources with blackbody spectra, for parameter values depicted in Figure 7.12. The limiting sensitivity for the detection of a source is dependent on both the background count rate and the estimated counts from the source. In Tables 7.2 and 7.3, we compute the source counts for on-axis point sources with different spectral shapes and estimate the flux that would be detected at 3σ in a 50 ksec observation. The source counts are assumed to be collected in a circle of radius 2", and the background is assumed to be collected in an area 10× larger. The source extraction radius is not optimized for source detection and is intended to provide ballpark estimates of the limiting sensitivity. For each spectral model, the counts-to-energy conversion factor is computed using effective area curves derived for recent AR Lac observations (ObsID 18387 for HRC-I, and ObsID 18366 for HRC-S). Note that the true effective area in both HRC-I and HRC-S shows a drop of ≈ 4% since c.2012, and this effect has not yet been included in the released effective areas or the limiting flux estimates. α = 1.4 4 6.1 6.5 9.3 12. 100 17. 18. 26. 36. 100 14. 15. 21. 28. 100 10. 11. 16. 21. 100 8.2 8.8 13. 17. 0.01 5.0 5.3 7.7 10. 100 5.2 5.5 7.9 11.
source circle and background collected in an area 10× larger. α = 1.4 4 6.0 6.3 9.2 12. 100 19. 20. 29. 39. 100 15. 16. 23. 31. 100 11. 12. 17. 22. 100 8.8 9.3 13. 18. 100 5.4 5.8 8.3 11. Initial observations with the HRC-I showed a faint secondary "ghost" image. This "ghost" image was a displaced, weaker ( ∼ 3%) image ∼ 10" on one side of every source in the HRC-I field of view, generally along the negative U axis of the instrument (Figure 7.1). The cause of this imaging anomaly is saturation of the fine position amplifiers. A change in the HRC-I operating high-voltage reduced the occurrence of saturating events and the previously mentioned event processing algorithms, which are now part of the CXO/HRC data pipeline, label these events and filter them out. The combination of the HV change and filtering have reduced the relative intensity of the ghost image to < 0.1 %, effectively eliminating it. If the location of the ghost image interferes with features of the source, the CIAO tool obsvis can be used to determine a roll angle that places the source features away from the ghost image. A similar ghost image existed in the HRC-S but at a much reduced intensity. The HRC has a hardware problem that corrupts the data from the position taps under a specific set of conditions: 1) the amplifier scale factor is switched to the least sensitive scale, 2) an even number of taps on the axis have signals that are above a set threshold, and 3) the event occurs on the negative side of the tap. When these conditions are met the tap signals are sampled while the amplifiers are still ringing after switching from the initial guess for the event coarse position to the correct one. The ringing results in offsets on the telemetered tap values from their true values, with the smallest signal of the triplet for an axis being most affected. When the event position is calculated from corrupted data, positions are incorrectly determined and can be off by a few pixels. This ringing is partially corrected for in ground processing (Juda et al. 2000). These corrections are implemented via the CIAO tool hrc_process_events. Observers, if they are concerned that the ringing may be producing artifacts, can apply additional filtering to remove events with AMP_SF=3. A wiring error in the HRC causes the time of an event to be associated with the following event, which may or may not be telemetered. The result is an error in HRC event timing that degrades accuracy from about 16 microsec to roughly the mean time between events. For example, if the trigger rate is 250 events/sec, then the average uncertainty in any time tag is less than 4 millisec. The HRC team has developed a special operating mode that allows high precision timing to be achieved (see Section 7.14.1). This timing mode uses only the central segment of the HRC-S. Disabling the outer two segments lowers the total count-rate by two-thirds, dropping it below the telemetry saturation limit for most sources. Thus, there is a high probability that all events will be telemetered. In this case, once the time tag of each event has been appropriately shifted in ground processing, the original timing accuracy (16 microsec) can be recovered. When using this approach, it is prudent to be sure that the total count-rate (source plus background) is somewhat below the telemetry saturation limit to avoid telemetry saturation due to statistical fluctuations in the count-rate. In addition to the primary science data for individual events, the rate of microchannel plate triggers (total rate) and triggers that pass on-board validity tests (valid rate) are telemetered to the ground. The valid rate is used to correct the primary rate for deadtime and telemetry saturation effects. 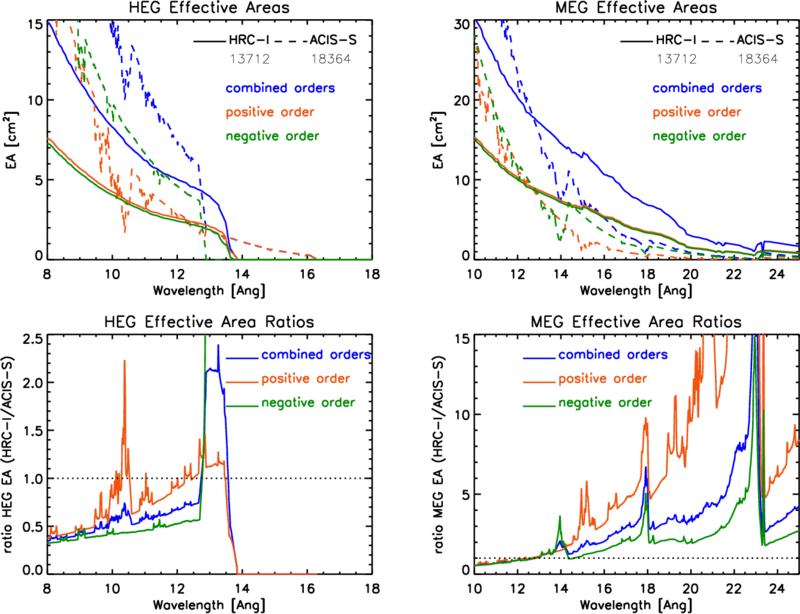 As long as the primary rate is below saturation, the primary rate itself can be used to make the small ( < 1%) correction, since the event processing dead-time is known. However, when the event rate exceeds saturation, a fairly common occurrence because of background flaring from low energy protons, the valid rate is necessary to correct the event rate. Unfortunately, the total and valid event rates are overestimated by about 15% for normal operation of the HRC-S . This problem is caused by an overshoot in occasional large trigger pulses, resulting in double counting in the total and valid event on-board scalers. The primary science event is not affected, since once event processing starts with the initial trigger pulse, a gate rejects further pulses until processing is complete. The HRC-I does not have this overshoot problem. The HRC-S valid event rate is corrected in standard processing, using the fraction of event pulse amplitudes that are above a given (segment dependent) threshold. The HRC PSF also suffers from a tailgating effect, where photons within the area of the PSF that are recorded rapidly after a previous photon have less accurate positions, leading to the PSF for these events being puffier (Juda 2012, http://cxc.cfa.harvard.edu/contrib/juda/memos/hrc_pileup/index.html). Photons with arrival time differences of < 0.05 sec are affected. Calibration of the HRC included laboratory calibrations, a system-level ground calibration with the HRMA and HRC at the X-ray Calibration Facility (XRCF) at MSFC, and on-orbit calibration using celestial X-ray sources. The on-orbit calibration of the HRC is an on-going activity. See Tables 7.4,7.5 for a list of HRC calibration targets. All calibration analysis is described in detail at ( http://cxc.harvard.edu/cal/Hrc ). In addition to the general Chandra observatory level constraints (Chapter 3), there are a few HRC-specific considerations and constraints that must be taken into account when planning an observation. Both the gain and the quantum efficiency are adversely affected by the total amount of charge extracted from the MCP at the point of extraction. To minimize such effects, the high voltage on the detector is lowered during passage through the radiation belts and at times of very high particle radiation. To limit the impact from X-ray sources themselves, a 450,000 count limit, per source, distributed over the dither pattern from an on-axis source at a given aimpoint has been imposed. (Any source with flux approaching the vicinity of 10−10 ergs cm−2 s−1 should be checked.) Users anticipating to exceed this count limit should so note in the comments section of the RPS form when submitting their proposal. In this case, the CXC will establish new aimpoints as necessary. Offsets in the pointing may be imposed, if necessary, to limit the accumulated dose to a given region of the MCP. The maximum telemetered count-rate is 184 cts s−1. This is a limitation on the total count-rate received over the full field-of-view rather than for one individual source within the field. It is possible to exceed this limit and to subsequently correct the total count-rate by using the secondary science rates, which keep track of the actual detected rate, to determine the deadtime correction (see Section 7.11). The resulting deadtime fraction increases rapidly with valid event rates above 184 cts s−1. For example, at 200 cts s−1 the deadtime fraction is 8%, at 250 cts s−1 26%, and at 300 cts s−1 39%. Listed below are some methods for dealing with situations where the telemetry limit is exceeded. Insert either the LETG or HETG and analyze the zeroth-order image. This solution may be so dramatic as to substantially increase the required observing time. Offset aimpoint. To be effective, this solution may result in substantially reduced spatial resolution. Depending on the proximity, an appropriate choice of roll angle and/or offset can position the offending source(s) off the detector. Flux from bright sources could be blocked with the HRC shutters, but note that only one blade is functional and this option is unavailable in the standard setup. Request a rectangular window for on-board data so that events produced by the nearby bright source(s) do not contribute to the telemetry limit. There are of course, other combinations and situations that can lead to telemetry saturation - numerous faint sources on the field, a too-bright extended source, etc. During ground calibration, the HRC-I was verified to be linear for incident photon rates at ∼ 2 cts s−1 pore−1, which translates to ∼ 5 cts s−1 for an on-axis point source (see Kenter et al. 1997, Figure 7). The HRC-S was found to be linear for rates five times greater. At much higher incident fluxes, the measured rate will be lower than expected (see Pease & Donnelly 1998; http://cxc.harvard.edu/cal/Hrc/detailed_info.html#ctrt_lin). Observations of the coronal point source Capella with the HRC-I show that the data are consistent with the nominal correction for a point source of intensity ∼ 19−22 ct s−1. Offset aimpoint to smear the image out. Insert a transmission grating to reduce the flux and offset aimpoint (if also necessary). Defocus - this option is not recommended and is only mentioned for completeness. Note that sources with high count-rates will also have smaller photon arrival time differences, which will cause the PSF to be broader (see Section 7.5). For many observations, it is only necessary to specify the instrument, the exposure time, and the target coordinates. However, there are a number of optional parameters that might be invoked to optimize a particular observation. Tools such as PIMMS and MARX can be used to plan an observation, e.g., to account for the background when estimating sensitivity. These tools may be found at http://cxc.harvard.edu/proposer/. The HRC-S is normally operated in spectroscopy mode, where signals from any of the three MCP segments can be recognized as triggers. An alternate mode of operation (timing) ties the signals from the outer segments to ground so that only signals from the center MCP generate triggers. A key distinction of this mode from using an edge-blanked region (described below) to select only the center MCP segment is that the timing mode selects events without using the on-board veto logic. This preferred method of doing high-precision timing observations reduces the active detector area, minimizing the total trigger rate. Provided that this rate is below telemetry saturation, all events will then be telemetered and the event time tags can be correctly assigned in ground processing (see Section 7.11). The HRC-S, when used in this mode, provides about a 6 x 30 arcmin field of view. It is possible to define a rectangular region, other than the default region, on both the HRC-I and the HRC-S. Events from either inside (edge-blanking) or outside (center-blanking) the defined regions are telemetered. This could be done, for example, to prevent events from a nearby bright source from contributing to telemetry (see Section 7.13.2). If a proposer wishes to define such a rectangular region, they should state this request in the "Remarks" field of the RPS form to prompt discussions with a CXC Support Scientist. David, L.P., Harnden, F.R. Jr., Kearns, K.E, and Zombeck, M.V., The ROSAT High Resolution Imager (HRI) Calibration Report, revised (1999). Fraser, G., "X-ray Detectors in Astronomy", 1989, Cambridge University Press. Giacconi, R., et al., 1979, Ap. J., 230, 540. Murray, S.S., Chappell, J.H., Elvis, M.S., Forman, W.R., Grindlay, J.E., Harnden, F.R., Jones, C.F., Maccacaro, T., Tananbaum, H.D., Vaiana, G.S., Pounds, K.A., Fraser, G.W., and Henry, J.P., "The AXAF High Resolution Camera (HRC) and its use for observations of Distant Clusters of galaxies" Astro. Lett. Comm., 26, 113-125, 1987. Zhao, P., 2014, CXC Memo, Nov 1 2014, Chandra Optical Axis, Aimpoint and Their Drifts The optical axis of the HRC-I is currently measured to be at (ChipX,ChipY)=(7586.7±14.2, 7741.8±4.7), and that of the HRC-S is at (ChipX,ChipY)=(2194.6±10.6,8913.4±10.6) (§ 4.5.5). Zombeck, M.V., Chappell, J. H , Kenter, A, Moore, R., W., Murray, S. S., Fraser, G.W., Serio, S.,"The High Resolution Camera (HRC) on the Advanced X-ray Astrophysics Facility (AXAF)", Proc. SPIE, 2518, 96, 1995. Karovska, M., 2011, "Followup Study of the PSF Asymmetry", CXC Memo, 2011-Jun. Kashyap, V., et al., 2005, "HRC-S Degap Corrections". Murray, S.S., Chappell, J.H., 1989, SPIE 1159, 460-475. "Position Modeling for the AXAF High resolution Camera (HRC)"
Murray, S.S., et al., "Event Screening for the Chandra X-ray Observatory High Resolution Camera (HRC)", SPIE Proceedings, 4140, 2000. Juda, M and Dobrzycki, A, "HRC Deadtime and Telemetry Saturation", 1999-Jun-18. Juda, M., "Telemetered vs. Processed Events", memo, 2001-Dec-07. Juda, M., "HRC-S Double Pulse Fraction", memo, 2002-Jun-27. Kenter, A.T., Chappell, J.H. Kobayashi,K.,Kraft,R.P., Meehan, G.R., Murray, S.S., Zombeck, M.V., Fraser, G.W., Pearson, J.F., Lees, J.E., Brunton, A.N. and Pearce, S.E. Barbera, M., Collura, A., Serio, S., "Performance and Calibration of the AXAF High Resolution Camera I " SPIE 3114, 1997. Pease, D.P., & Donnelly, H., memo, 1998-May. Zombeck, M. V., "Secondary Science Rate Double Counting", memo, 2002-Dec-02. Kenter, A.T., Chappell, J., Kobayashi, K., Kraft, R.P., Meehan, G.R., Murray, S.S., Zombeck, M.V., "Performance and Calibration of the AXAF High Resolution Camera: I. Imaging Readout", SPIE, 3114, 26, 1997. Kenter, A., et al., "In-flight Performance and Calibration of the Chandra High Resolution Camera Spectroscopic Readout (HRC-I)" SPIE, 4012, 2000. Kraft, R.P., Chappell, J., Kenter, A.T., Kobayashi, K., Meehan, G.R., Murray, S.S., Zombeck, M.V., "Performance and Calibration of the AXAF High Resolution Camera: II. the Spectroscopic Detector", SPIE, 3114, 53, 1997. Kraft, R., et al., "In-flight Performance and Calibration of the Chandra High Resolution Camera Spectroscopic Readout (HRC-S)" SPIE, 4012, 2000. Meehan, G.R., Murray, S.S. , Zombeck, M.V., Kraft, R.P., Kobayashi, K., Chappell, J.H., and. Kenter, A.T., "Calibration of the UV/Ion Shields for the AXAF High Resolution Camera", SPIE, 3114, 74, 1997. Meehan, G, "Calibration of the HRC-I UV/Ion Shield", 1999-Oct-13. Meehan, G.,"Calibration of the HRC-S UV/Ion Shields", 1999-Oct-13. Murray, S. S.; Chappell, J.H. ; Kenter, A. T.; Kobayashi, K.; Kraft, R. P.; Meehan, G. R.; Zombeck, M. V.; Fraser, G. W.; Pearson, J. F.; Lees, J. E.; Brunton, A. N.; Pearce, S, E.; Barbera, M.; Collura, A.; Serio, S., "AXAF High-Resolution Camera (HRC): calibration and recalibration at XRCF and beyond", SPIE, 3114, 11, 1997. Isobe, T., and Juda, M., memo, 2007-Sep-11. Isobe, T., and Juda, M., 2007, "High Resolution Camera Stowed Background Study", Proc. of Chandra Calibration Workshop, October 2007, Huntsville, AL. Isobe, T., and Juda, M., 2009, "How to Create a Background Map for an Observation", memo, 2009-Jan-27. Isobe, T., and Juda, M., 2009, "How to Create a Background Map for an Observation", Proc. of Chandra Calibration Review, September 2009, Boston, MA. Juda, M., "Time History of the HRC Background", memo, 2001-May-22. Juda, M., "HRC Rates and High Solar Activity", memo, 2001-May-21. Kenter, A.T., K.A. Flanagan, G. Meehan, S.S. Murray, M.V. Zombeck, G.W. Fraser, J.F. Pearson, J.E. Lees, A.N. Brunton, and S.E. Pearce, "Microchannel plate testing and evaluation for the AXAF high resolution camera (HRC)", Proc. SPIE, 2518, 356, 1995. Zombeck, M.V., "HRC-I out of band response." Zombeck, M.V., "HRC-S out of band response." Zombeck, M.V., et al., "Vega calibration observations." Zombeck, M.V., et al., "The Out-of-band Responses of the HRC on Chandra", X-ray 2000 Proceedings, Palermo, 2000. Zombeck, M. V., "Response of the HRC to Vega", memo, 2002-Oct-28.